The Brownsville Chamber of Commerce and Texas Regional Bank host the annual Charro Days Mixer. 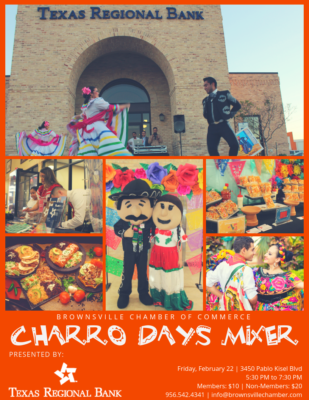 The event features food and snacks and a performance by the UTRGV Ballet Folklórico dance group. Attendees should bring their best Charro costume and practice their Grito for a chance to win door prizes. Admission is $10 for chamber members, $20 non-members. Register online or by contacting the chamber.